Hello, Chrissy here again and today I’m reviewing Diamine Pelham Blue ink. Diamine Pelham Blue is a slightly teal leaning, saturated, dark cerulean blue ink. Even though it’s more saturated than the other inks in this series, it still exhibits some nice shading. I found I didn’t have many blue inks in this colour range, so it’s quite an unusual shade. Oxford Blue has more red in it than Pelham Blue does. I found the flow very good, neither wet nor dry, although it dried quickly on most of the papers I tested it on. Once dry it didn’t smudge or smear. Lubrication was really smooth across the page. It was really nice to write with. 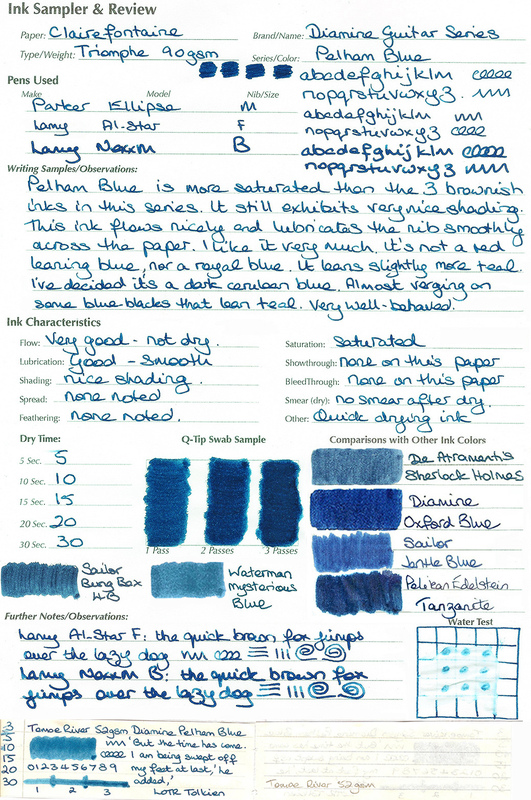 Pelham Blue is an ink that can vary in colour quite a bit depending on what paper you use it on. It looks much lighter on Tomoe River and Maruman papers. In fact, on Tomoe River paper it reminded me of the long discontinued, but legendary Montblanc Meisterstück Diamond Blue ink. It took two washes to wash off of my fingers with soap and water but it easily flushed out of my converters and pens just using water. Non-staining. It's not a waterproof ink. but exhibits some water resistance after it's dry.